The industry appetite for improved shielding effectiveness is constantly increasing. 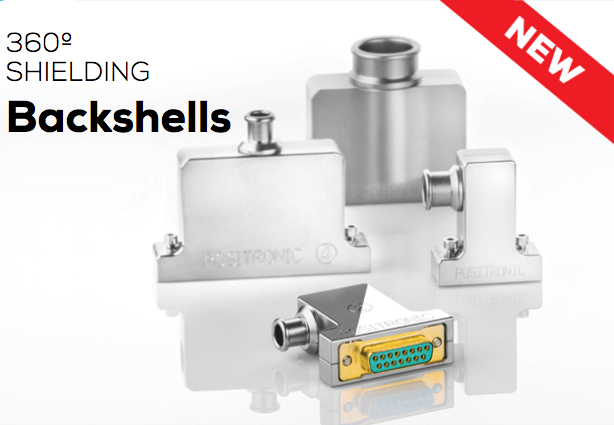 In keeping with this trend, Positronic is releasing the EM360 banding backshell for D-sub connector applications where 360° shield termination is required. The EM360 product is targeted to spaceflight and commercial aerospace applications where overall shielding is a necessity. Pricing and availability for the EM360 backshell is available by contacting your local Positronic office. Positronic is a global manufacturer of high reliability electronic connectors and build-to-print cable assemblies for use in various applications related to military, space, commercial aerospace, medical, industrial, test and rail among others. Core capabilities include solid machined contacts with low resistance/high conductivity for use in standard and quick-turn custom connectors. Key products include high power, D-sub, rectangular, modular and circular connectors. Many parts are available immediately off-the-shelf using PosiShop.com. Customized solutions are available as well. Positronic is known globally for the unique ability to quickly modify existing or create new products to meet application-specific needs. Visit http://www.connectpositronic.com for more details.